Located in Midway, the wall is built of hot spring tufa. 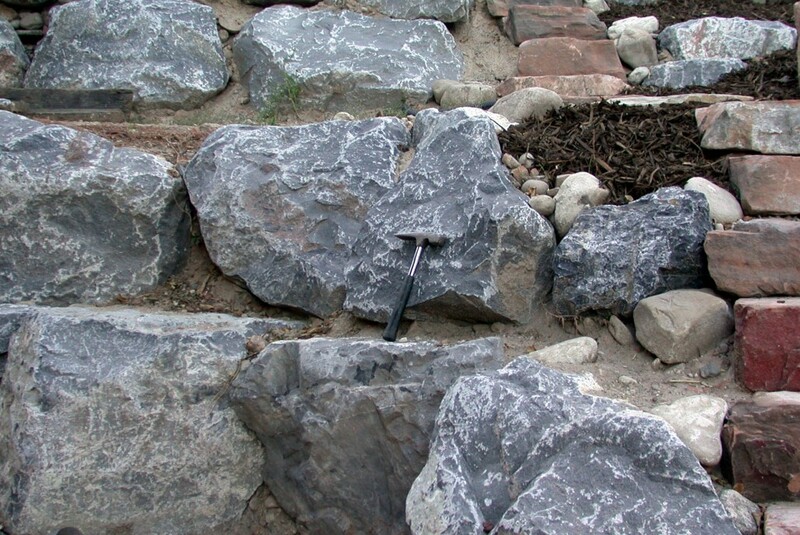 The June 2001 Survey Notes article, “Where can I collect landscaping rock on public land?” generated more follow-up inquiries than any other “Glad You Asked” column. 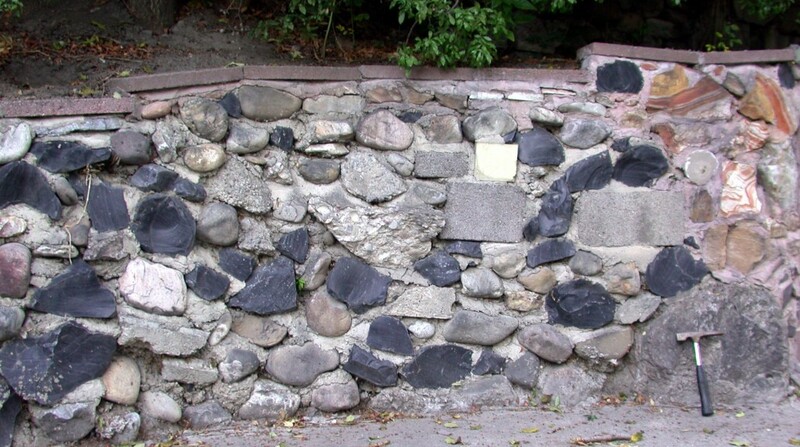 Many questions pertained to stone wall composition, which prompted us to research the subject. 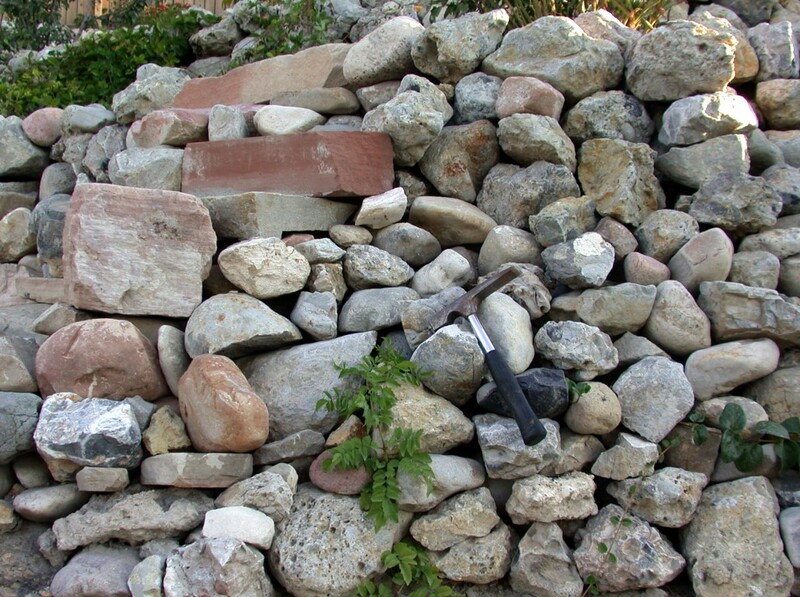 Our investigations led us to conclude that stone walls in Utah are made of just about everything! 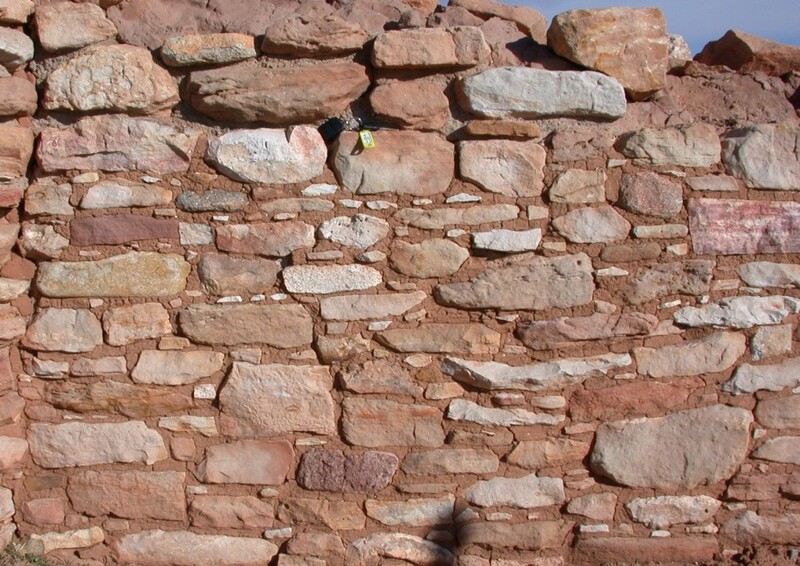 Any stone that is not overly soft and crumbly seems to have been used for a wall. The following photos are just a sampling of the variety of stone walls we saw in only one day and are located near the state capitol unless otherwise noted. 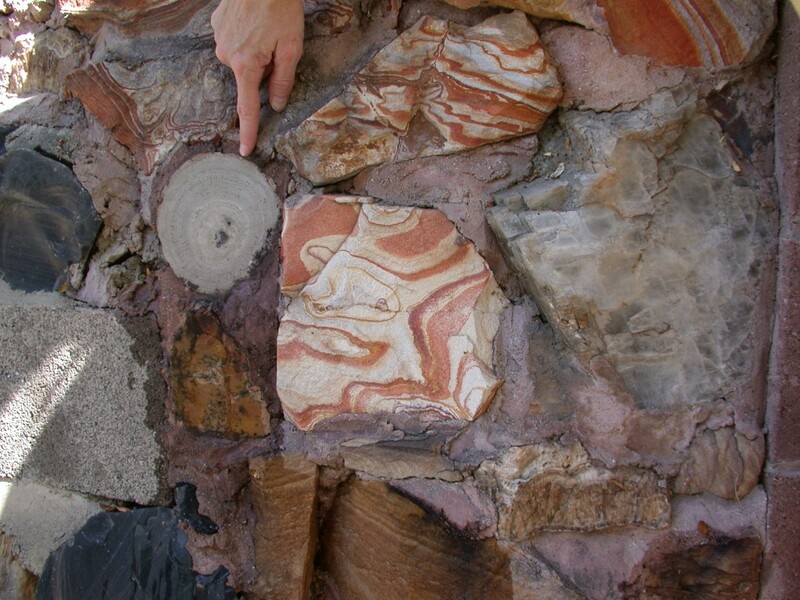 Look around and you are sure to see many variations, including walls made with faux stone (concrete “rocks?”). 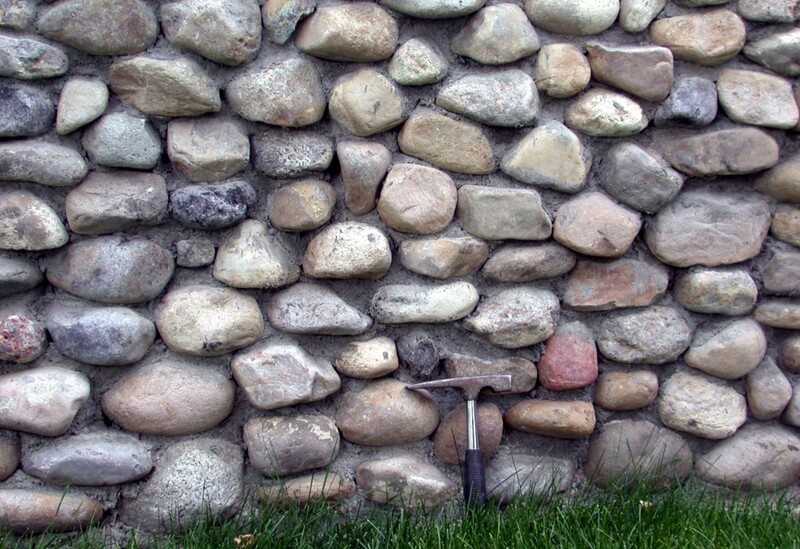 If you are considering building your own stone wall, libraries carry dozens of books that address the finer points of stone masonry. Bear in mind that unreinforced masonry is susceptible to damage during even moderate earthquakes. 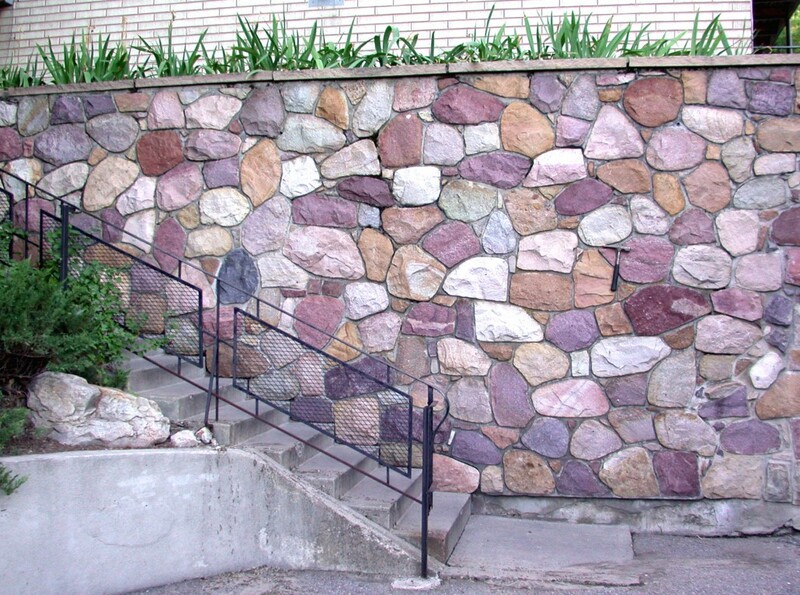 For high walls or those critical to holding back a slope, consult a geotechnical engineer. 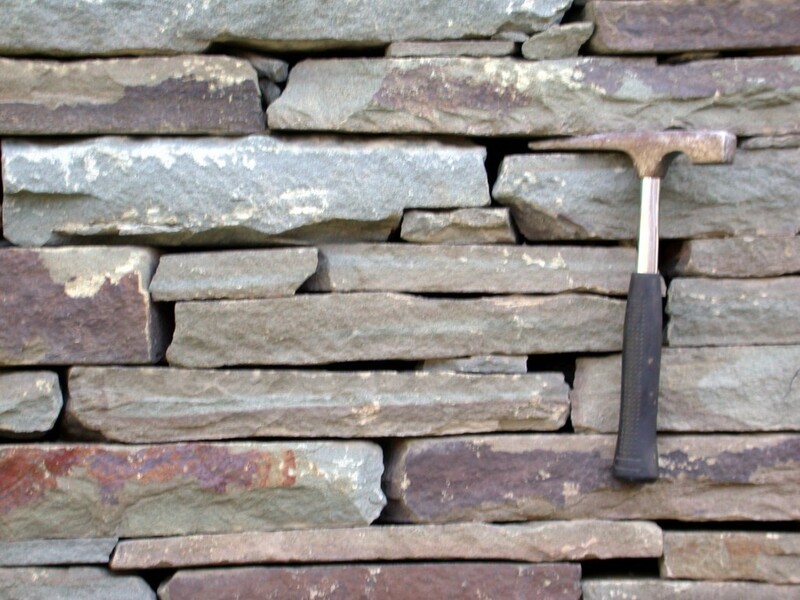 Stone walls are of two basic types: dry stacked and mortared. These two stone walls use flat, blocky stones that are easily hand stacked to form a vertical wall. 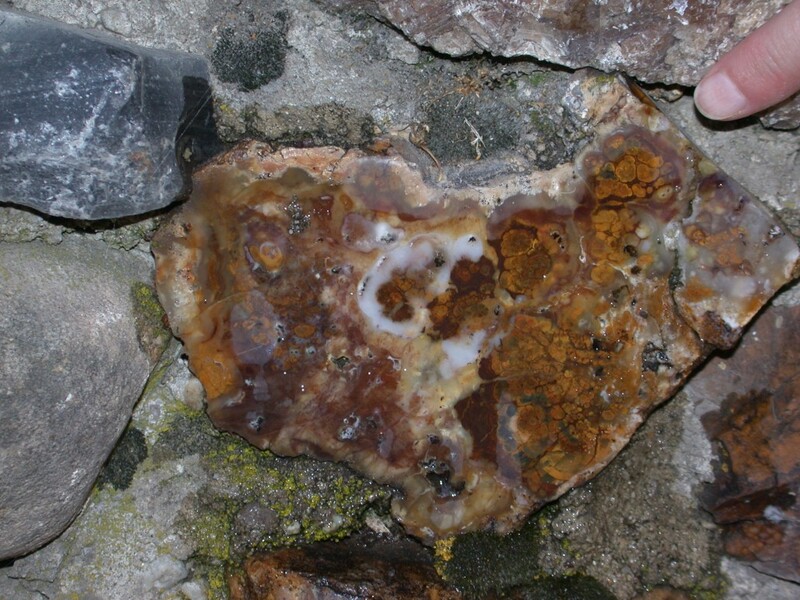 The stones are held up entirely by underlying stones. 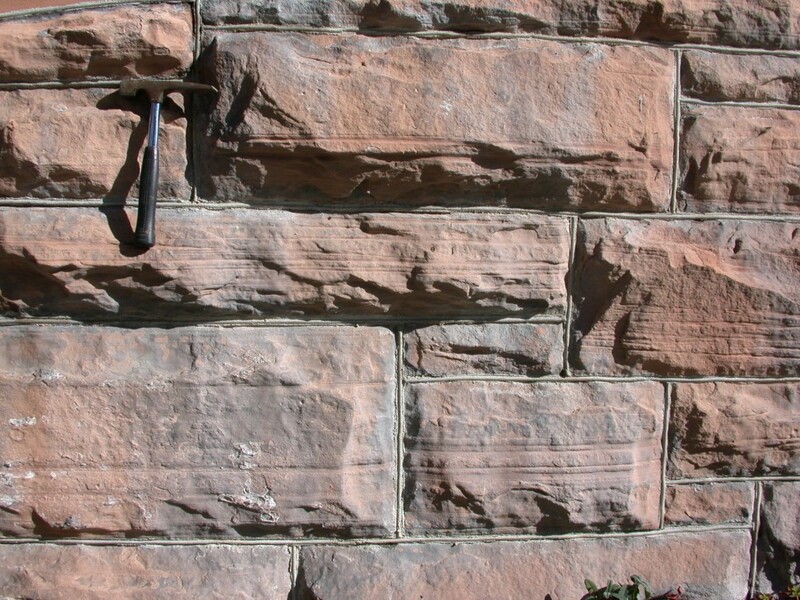 This wall is built of gray, flaggy sandstone. 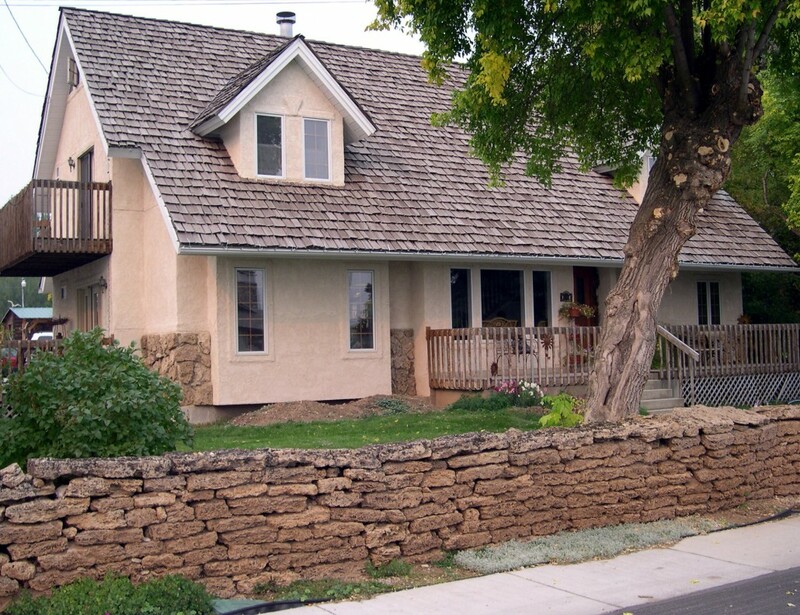 Located in Midway, this wall is built of hot spring tufa. These two walls contain large (1/2 to 2 tons) boulders trucked to the site and set using heavy equipment. Both walls are sloped back onto the hillside and thus the stones are in part held up by the hillside itself. 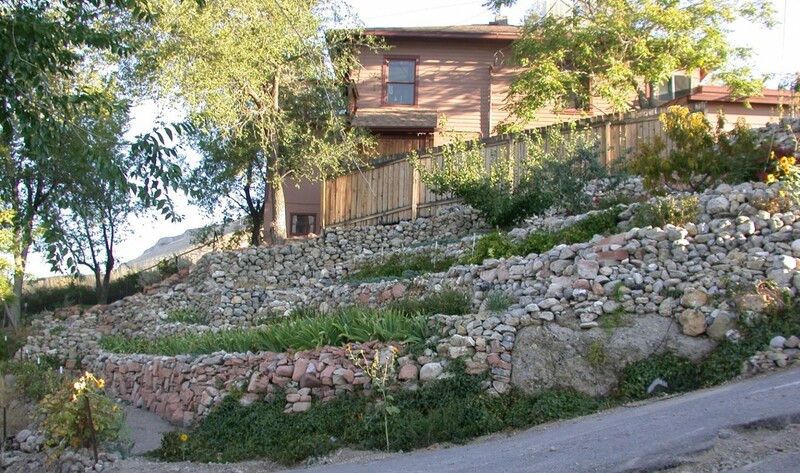 Such walls work well for erosion control. 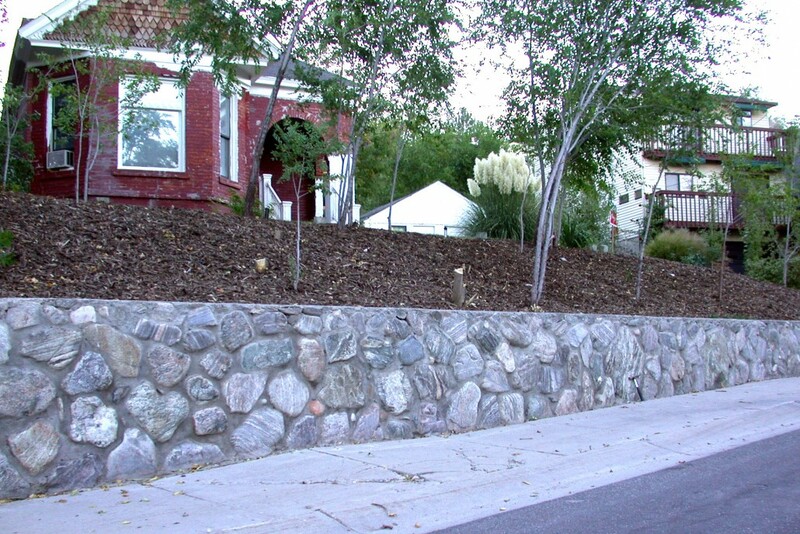 This wall is built of rounded quartzite fieldstone taken (not blasted) from a quarry probably in Davis County. 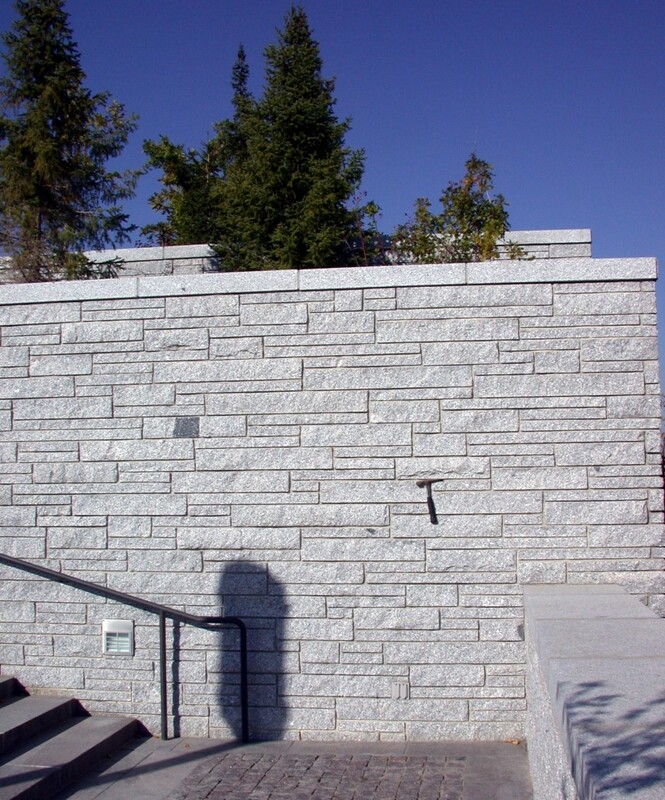 This wall is built of angular limestone blocks blasted from a quarry on the west side of Utah Lake. This amazing series of terraces is built of hand-stacked, oddshaped, angular and rounded cobbles and boulders, proving that dry stacked walls can take advantage of what’s at hand and need not be entirely of blocky stone. 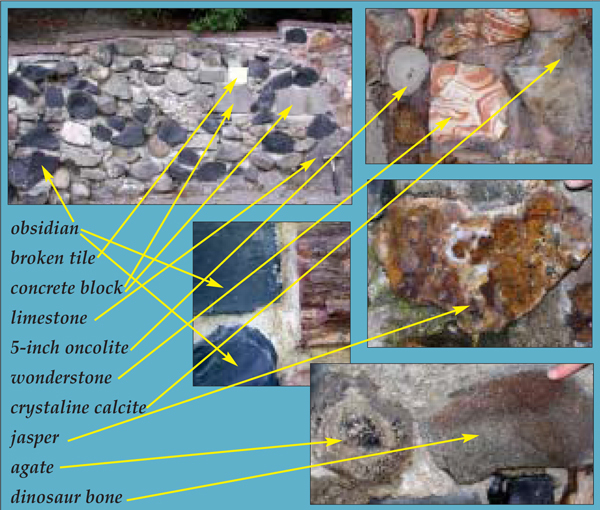 Rock types include sandstone, limestone, and conglomerate. 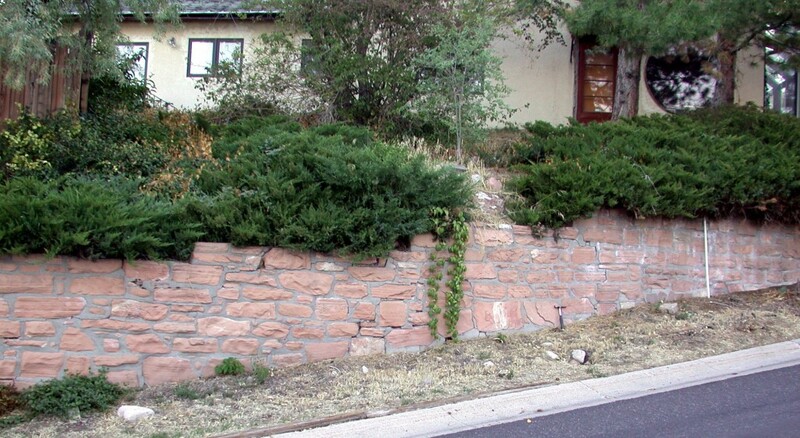 Mortared stone walls have been built in Utah for more than 1,000 years. 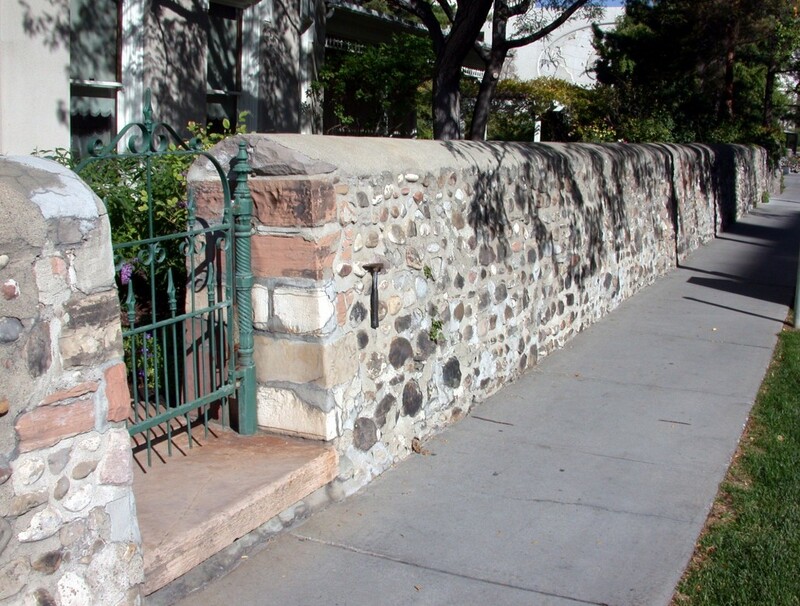 These photos show a wall located at the historic (circa 1856) Lion House in Salt Lake City. 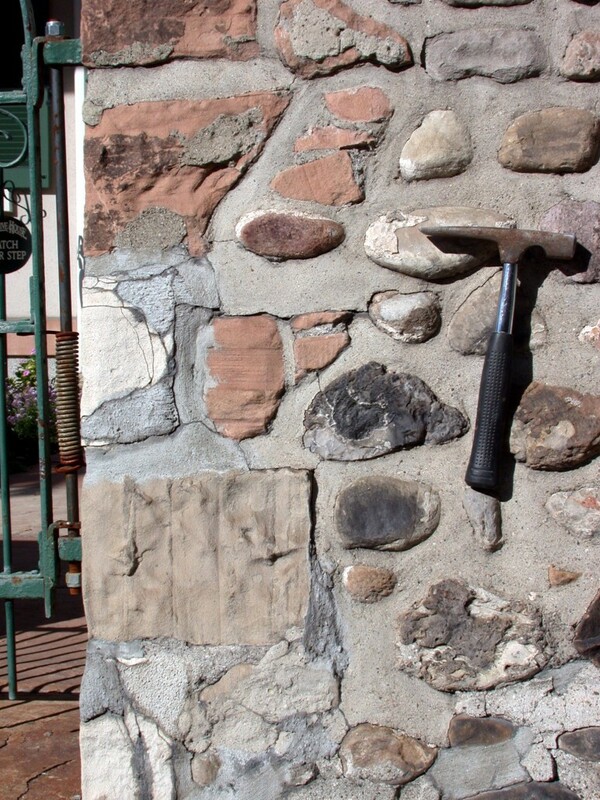 It would have originally been built with a lime mortar that is similar to but softer than modern concrete. Stones include local sandstone and limestone cobbles and sandstone corner blocks. 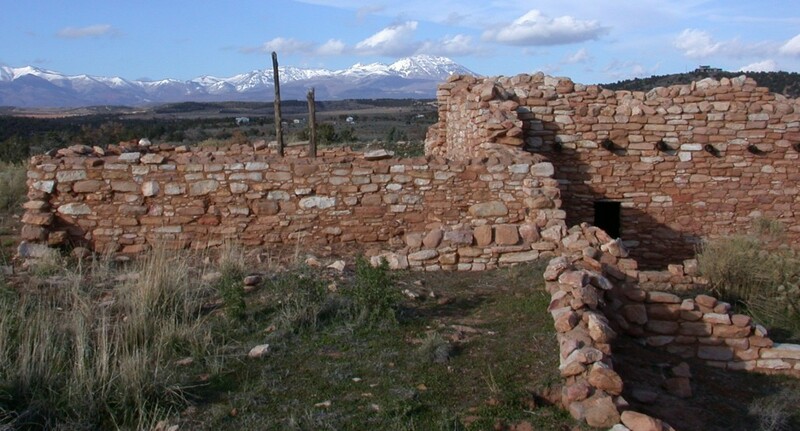 These photos show reconstructed pre-Colombian Pueblo Indian walls at Edge of the Cedars State Park near Blanding. 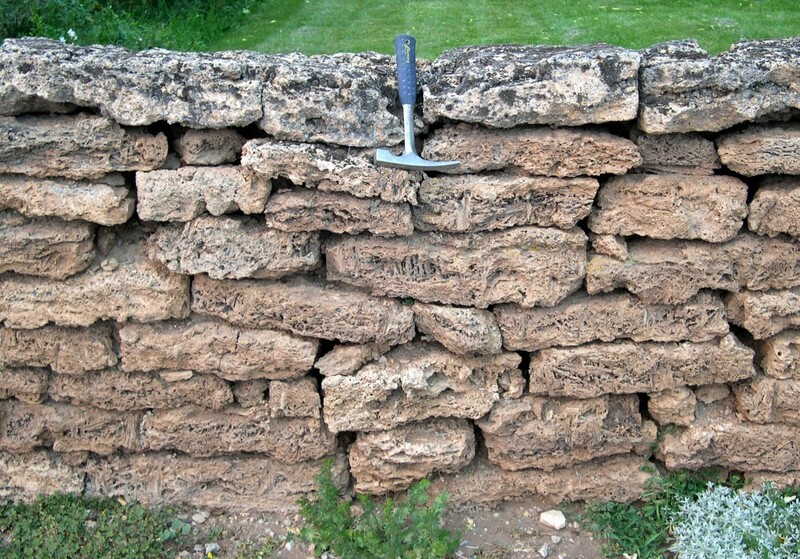 The original wall was probably built around A.D. 800 with mud mortar, and sandstone and diorite rocks collected at the site. 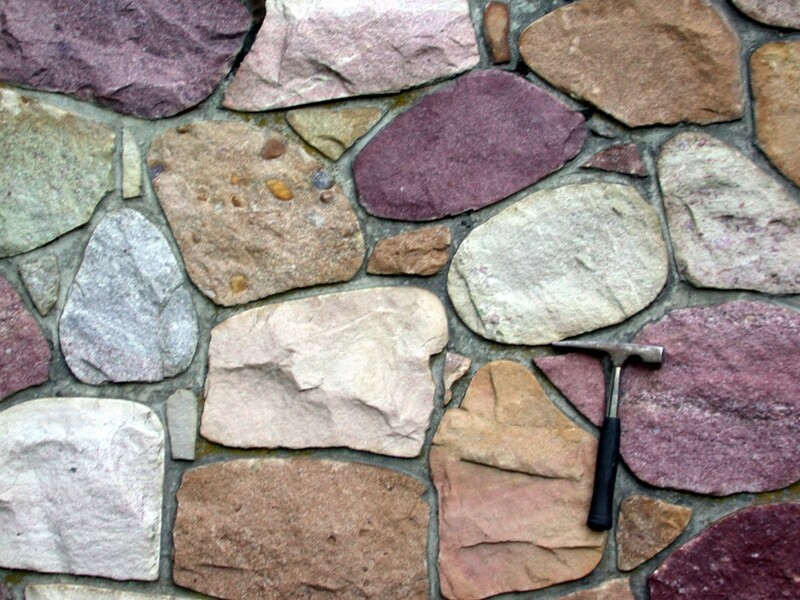 Any shape rock can be placed in any orientation when it is floated in mortar. 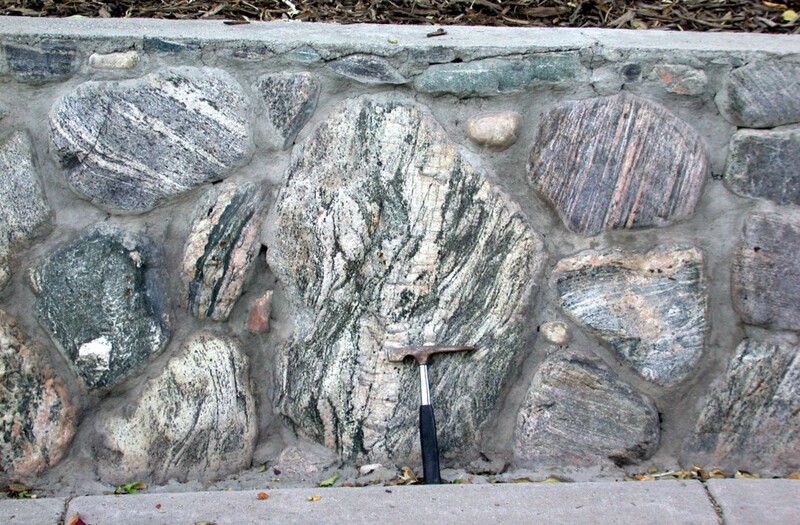 These photos show gneiss cobbles and boulders from Davis County. 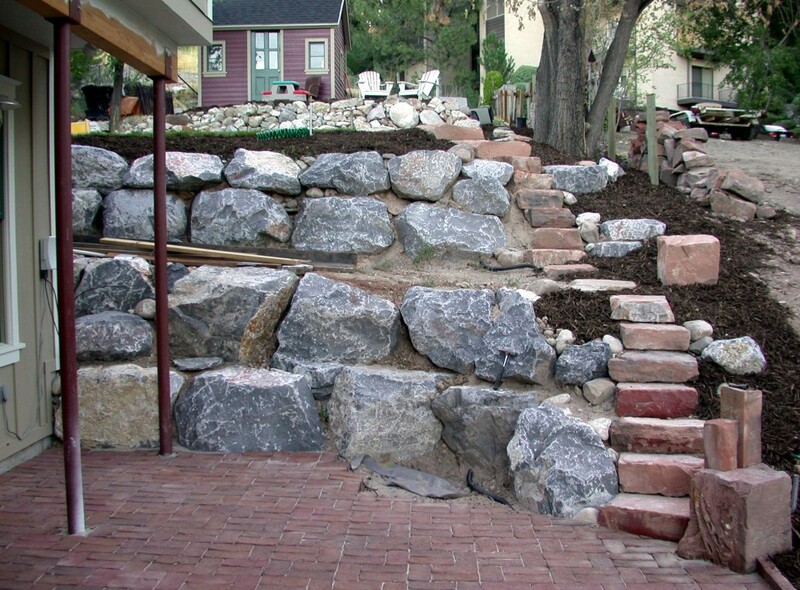 These photos show rounded sandstone and limestone cobbles from City Creek Canyon with a few granitic cobbles from Little Cottonwood Canyon (both in Salt Lake County). 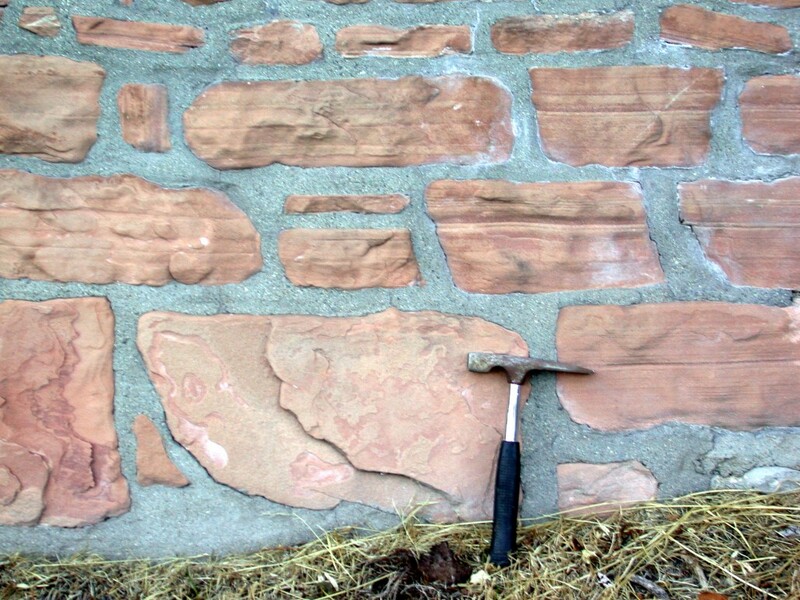 Both of these walls are built with Nugget Sandstone. 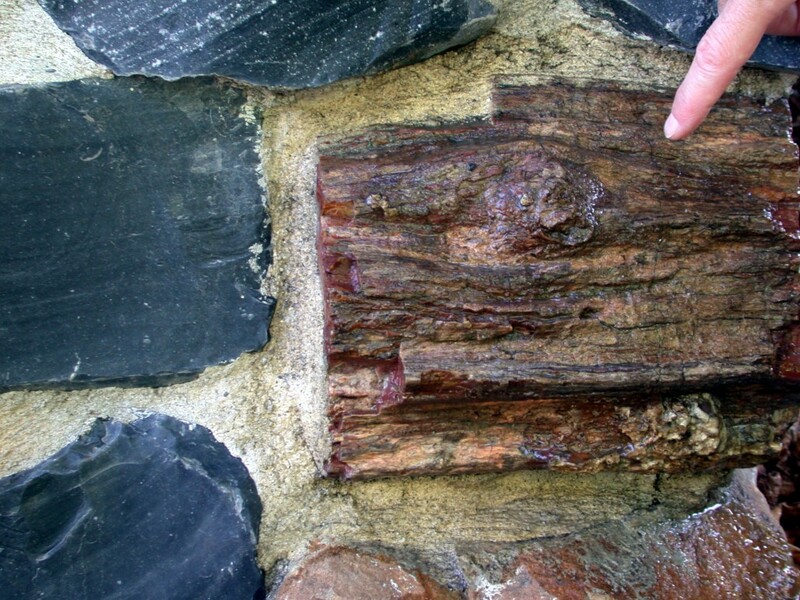 This wall uses tightly fit, handhewn blocks. This wall uses random shapes and sizes floated in mortar. 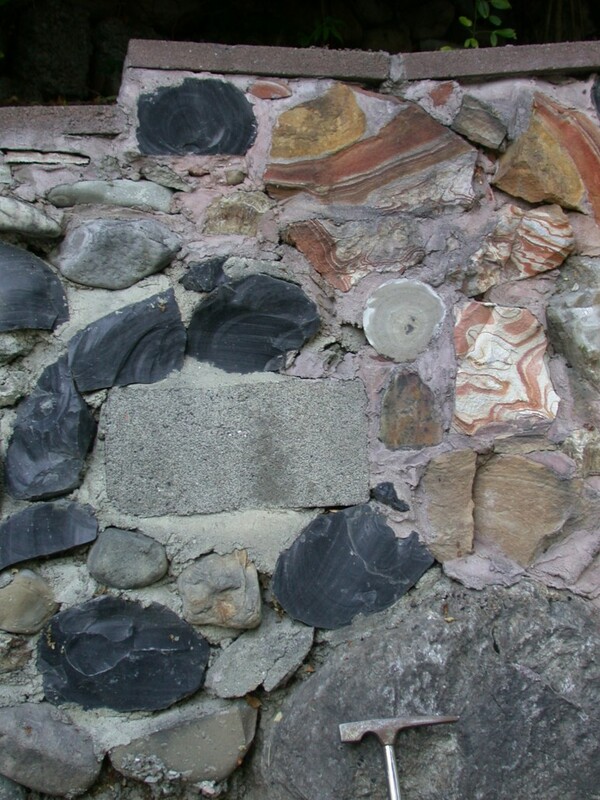 The stone on both of these walls is not structural, but a thin veneer. 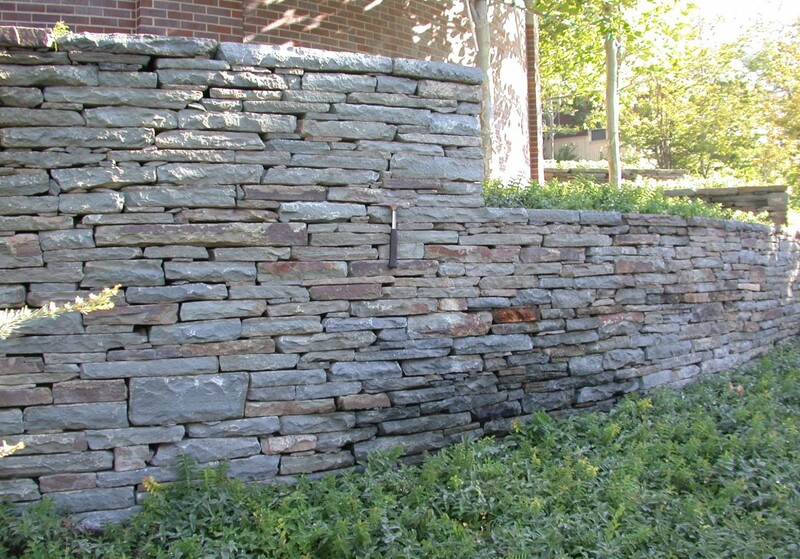 This wall is veneered with split-face quartzite fieldstone. 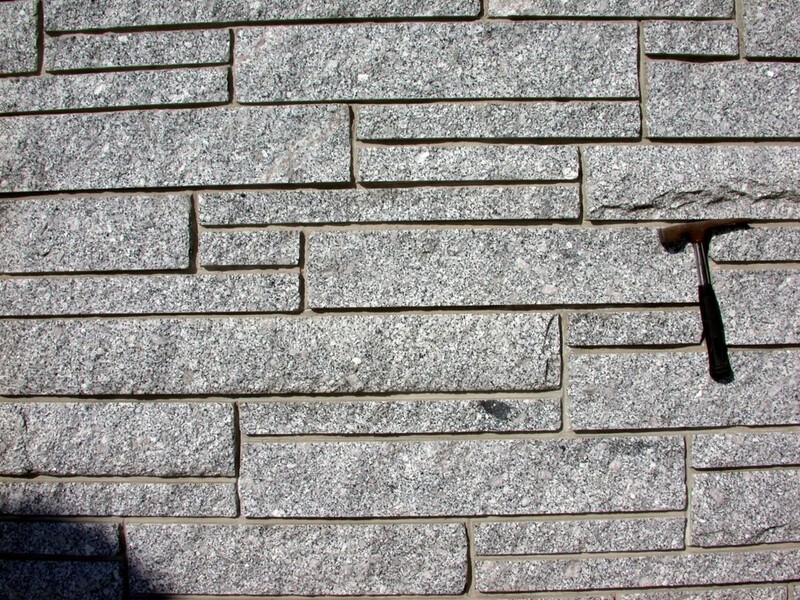 Part of a new conference center in downtown Salt Lake City, this wall is clad in cut granitic blocks from Little Cottonwood Canyon (Salt Lake County). 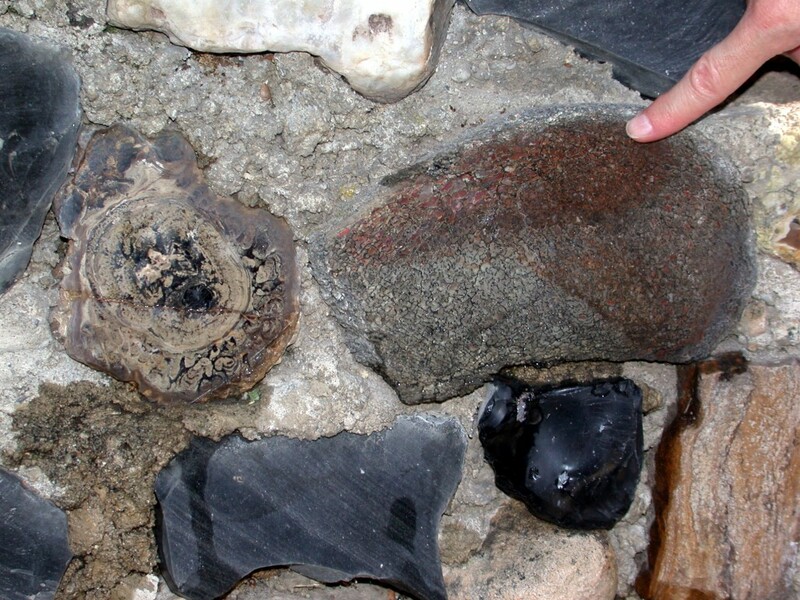 This wall is composed of black and mahogany obsidian, andesite, limestone, marble, crystalline calcite, travertine, jasper, agate, picturestone, wonderstone, sandstone, coal, petrified wood, algal boundstone, concrete block, broken concrete, broken tile, drill-hole core, 5-inch oncolite (algal ball), and a piece of petrified dinosaur bone.